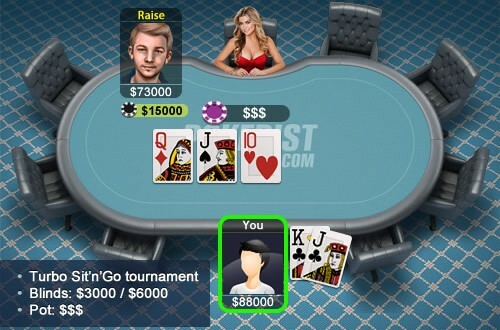 You’re playing a turbo sit and go tournament, and have reached heads up play. Your stack is virtually even with your opponents. The blinds are 3,000/6,000, and you both have 100,000 in chips. You minimum raise with KJ suited before the flop, get called, and the flop comes QJ10 rainbow. The big blind leads for 15,000.